The Fox Film Corporation was an American company that produced motion pictures, formed by William Fox on 1 February 1915. It was the corporate successor to his earlier Greater New York Film Rental Company and Box Office Attractions Film Company. William Fox entered the film industry in 1904 when he purchased a one-third share of a Brooklyn nickelodeon for $1,667. [lower-alpha 1] He reinvested his profits from that initial location, expanding to fifteen similar venues in the city, and purchasing prints from the major studios of the time: Biograph, Essanay, Kalem, Lubin, Pathé, Selig, and Vitagraph. After experiencing further success presenting live vaudeville routines along with motion pictures, he expanded into larger venues beginning with his purchase of the disused Gaiety theater,[lower-alpha 2] and continuing with acquisitions throughout New York City and New Jersey, including the Academy of Music. Fox invested further in the film industry by founding the Greater New York Film Rental Company as a film distributor. However, the major film studios formed the Motion Picture Patents Company in 1908 and the General Film Company in 1910, in an effort to create a monopoly on the creation and distribution of motion pictures. Fox refused to sell out to the monopoly, and sued under the Sherman Antitrust Act, eventually receiving a $370,000[lower-alpha 3] settlement, and ending restrictions on the length of films and the prices that could be paid for screenplays. Always more of an entrepreneur than a showman, Fox concentrated on acquiring and building theaters; pictures were secondary. The company's first film studios were set up in Fort Lee, New Jersey where it and many other early film studios in America's first motion picture industry were based at the beginning of the 20th century. In 1917, William Fox sent Sol M. Wurtzel to Hollywood to oversee the studio's West Coast production facilities where a more hospitable and cost-effective climate existed for filmmaking. Fox had purchased the Edendale studio of the failing Selig Polyscope Company, that had been making films in Los Angeles since 1909 and was the first motion picture studio in Los Angeles. Overextended and close to bankruptcy, Fox was stripped of his empire in 1930 and ended up in jail. Fox Film, with more than 500 theatres, was placed in receivership. A bank-mandated reorganization propped the company up for a time, but it soon became apparent that despite its size, Fox could not stand on its own. Under new president Sidney Kent, the new owners began negotiating with the upstart, but powerful independent Twentieth Century Pictures in the early spring of 1935. The two companies merged that spring as 20th Century-Fox (the hyphen was dropped in the 1980s). For many years, 20th Century Fox claimed to have been founded in 1915. For instance, it marked 1945 as its 30th anniversary. However, in recent years it has claimed the 1935 merger as its founding, even though most film historians agree it was founded in 1915. In 1919, Fox began a series of silent newsreels, competing with existing series such as Hearst Metrotone News, International Newsreel, and Pathé News. Fox News premiered on 11 October 1919, with subsequent issues released on the Wednesday and Sunday of each week. Fox News gained an advantage over its more established competitors when President Woodrow Wilson endorsed the newsreel in a letter, in what may have been the first time an American president commented on a film. In subsequent years, Fox News remained one of the major names in the newsreel industry by providing often-exclusive coverage of major international events, including reporting on Pancho Villa, the airship Roma, the Ku Klux Klan, and a 1922 eruption of Mount Vesuvius. The silent newsreel series continued until 1930. 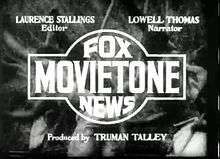 In 1926, a subsidiary, Fox Movietone Corporation, was created, tasked with producing newsreels using Fox's recently acquired sound-on-film technology. The first of these newsreels debuted on 21 January 1927. Four months later, the 25 May release of a sound recording of Charles Lindbergh's departure on his transatlantic flight was described by film historian Raymond Fielding as the "first sound news film of consequence". Movietone News was launched as a regular newsreel feature 3 December of that year. Production of the series continued after the merger with Twentieth Century Pictures, until 1963, and continued to serve 20th Century Fox after that, as a source for film industry stock footage. Hundreds of one- and two-reel short films of various types were also produced by Fox. Beginning in 1916, the Sunshine Comedy division created two-reel comedy shorts. Many of these, beginning with 1917's Roaring Lions and Wedding Bliss, starring Lloyd Hamilton, were slapstick, intended to compete with Mack Sennett's popular offerings. Sunshine releases continued until the introduction of sound. Other short film series included Imperial Comedies, Van Bibber Commedies (with Earle Foxe), O'Henry, Married Life of Helen and Warren, and Fox Varieties. Fox's expansion into Spanish-language films in the early 1930s also included shorts. ↑ Solomon 2011, pp. 10–11. ↑ Solomon 2011, p. 11. ↑ Solomon 2011, pp. 11–12. 1 2 Solomon 2011, p. 12. ↑ Solomon 2011, p. 13. ↑ Slide 2001, pp. 26–27. ↑ Canemaker 2005, p. 182. ↑ Crafton 1993, p. 112. ↑ Golden 1996, p. 30. ↑ Shepherd 2013, p. 197. ↑ Solomon 2011, pp. 14, 227. ↑ Koszarski, Richard (2004). Fort Lee: The Film Town. Indiana University Press. ISBN 0-86196-652-X. ↑ "Studios and Films". Fort Lee Film Commission. Archived from the original on April 25, 2011. Retrieved May 30, 2011. ↑ Fort Lee Film Commission (2006). Fort Lee Birthplace of the Motion Picture Industry. Arcadia Publishing. ISBN 0-7385-4501-5. ↑ Pierce, David. "The Legion of the Condemned — Why American Silent Films Perished". Film History. 9 (1): 5–22. ↑ Solomon 2011, p. 1. ↑ Fielding 2011, p. 60. ↑ Fielding 2011, p. 61. 1 2 3 Wilsbacher, Greg. "The Fox Movietone News Donation: A Brief History". Moving Image Research Collections. University of South Carolina. Retrieved 2015-02-06. ↑ Fielding 2011, pp. 102–104. ↑ Fielding 2011, p. 105. ↑ Solomon 2011, p. 57. ↑ Solomon 2011, p. 23. ↑ Solomon 2011, pp. 30–31. ↑ Solomon 2011, pp. 49–50. ↑ Solomon 2011, p. 71. ↑ Solomon 2011, p. 145. Wikimedia Commons has media related to Fox Film films.